- In the heart of every woman, there is a primitive pulse that beats in time with Nature. Like the horned Goddess herself, we can be fiercely protective, gently nurturing, or deadly dangerous, depending on the need. 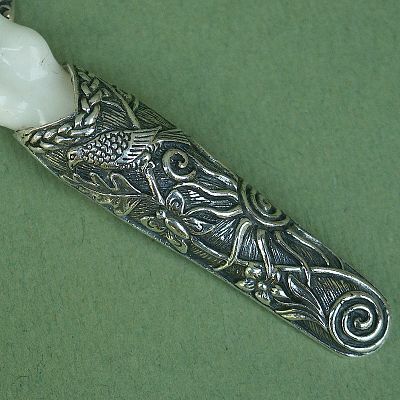 This pendant, expertly crafted from carved bone (now tea-dyed to bring out the detail) and sterling silver, celebrates that wild and free soul within each of us. 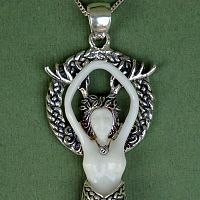 Bearing a deer's antlers, and crowned with a nimbus of Celtic knotwork, the forest Goddess is the embodiment of Nature. She does not rule over the land; She is the land itself, and all the life within it. 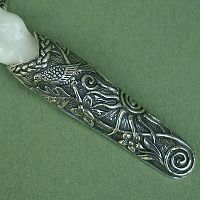 The lower half of the Goddess pendant is wrapped in a sheath of sterling silver, with a myriad of fine details worked into it: oaken branches, a bird, flowers, even the Sun itself. 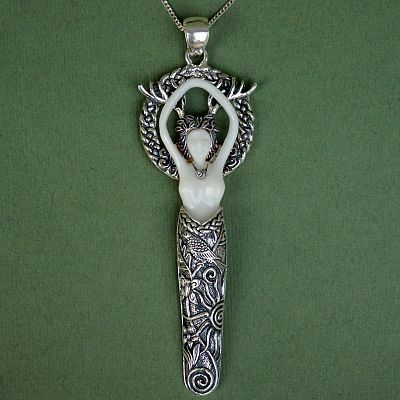 This breathtaking pendant measures over 3" tall, including the bail. 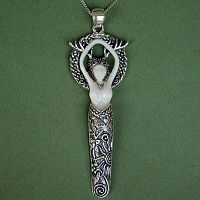 It comes with an 18" sterling silver chain. Who is Elen of the Ways? Most often, when we see a female deity in a wilderness setting, she is identified as Artemis or Diana, the goddess of the hunt in the greek/Roman pantheon. 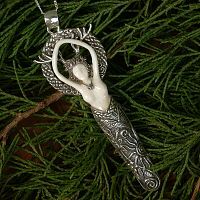 But the Welsh had a forest goddess as well, and she was known as Elen of the Ways. As a woodland goddess, Elen is closely associated with birth, death, and all that lies between. 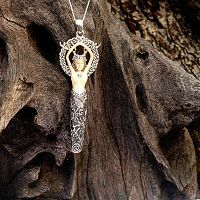 As a protector of the pathways, she is the guardian and guide of travelers, be they human or animal. Often, she may be found when one seeks to tread the hidden path between the worlds. Do you have any other questions about our Silver Forest Goddess Pendant?